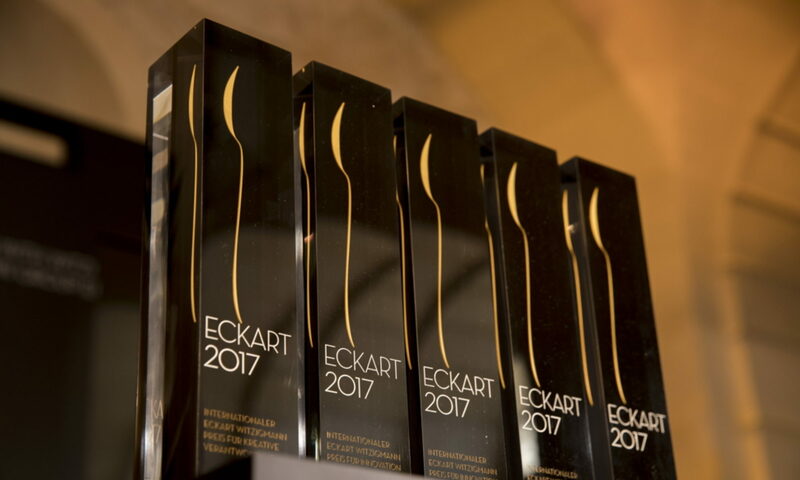 The International Eckart Witzigmann Award is awarded in partnership with the Gastronomy Academy of Germany (GAD). The award winners in 2011 continue the series of outstanding award winners of the past eight years, such as Ferran Adrià, Marc Haeberlin, Thomas Keller, Frédy Girardet, Harald Wohlfahrt, Dieter Müller, Anne-Sophie Pic, Hiroyuki Hiramatsu, Alice Waters, Juan Mari and Elena Arzak, Vincent Klink, and HRH Prince Charles of Wales, Carlo Petrini, Günter Grass, Dieter Kosslick and the artists Daniel Spoerri, Tomi Ungerer and Dieter Krieg. Together with their family, Nadia and Antonio Santini have made the “Dal Pescatore” in Lombardy – which they run with heart and soul and an awareness of local products – into an institution in Italy, or in fact in Europe. The gourmet country inn, opened by their grandparents as a simple inn near Mantua in Lombardei, has become a pilgrimage site for connoisseurs from all over the world. It is considered a local stronghold of tradition at the highest possible level. Nadia’s lavish cuisine and Antonio’s grand air as host are legendary. Born in Lyon, Daniel Boulud has been celebrating a grand cuisine with seasonal accents for more than 30 years at the focal point New York. As one of the best chefs in the world, Daniel Boulud has received the highest awards numerous times for his superlative prowess – for instance, three stars from Guide Michelin and four stars from the New York Times. In all the years, his art of cookery has never forfeited curiosity and creativity. That is the basis on which he – highly respected around the world by his colleagues – can achieve outstanding successes at his restaurants, of which there are now ten all over the world. He could already cook before he learned to read and write. His grandma knew: some day, Claus Peter will become a cook. After stations in Europe’s best restaurants, Claus Peter Lumpp took over in 1992 the task of head chef at the Hotel Bareiss in Baiersbronn, the “village of the Michelin stars” in the Black Forest. There he developed a great cuisine that brings together local identity and international class in an exemplary manner. By appreciating and making use of regional products and seasonal offerings out of deep personal conviction, he bases his great success on working in the kitchen in an ecologically sustainable manner. In this way, Claus Peter Lumpp has become a significant lifestyle ambassador. For more than half a century, Manfred Friedel worked, or rather exerted his influence, in the Munich hotel Königshof. He began as a page in the renowned establishment; in 1972 he became the head of the restaurant – and thus its face to the world. A man of the world who hosted the world. In his uniquely loving yet strict manner, Manfred Friedel has inspired countless young people for the service profession in the many years he has been working – and he has also conveyed this great craft and art to them. Manfred Friedel has placed his life in the service of hospitality. There are only a few like him who have cultivated such a significant culture of being a host! Tohru Nakamura was already interested as a six-year old boy in the culinary arts of both his German mother and his Japanese father. Tohru Nakamura began his apprenticeship as cook after completing his secondary education in Munich and he ended his apprenticeship as Germany’s best young chef. His career path proceeded upwards and to the north at a brisk pace: today the 27-year old is working with Sergio Herman in the “Oud Sluis” restaurant in the Netherlands. It is quite apparent that Tohru Nakamura has internalised the ever so important Japanese philosophy of life, whereby great value is placed on the quality of food products. For him dishes are best when the basic product can be clearly recognised. Johann Willsberger is a legend in the world of the art of cooking. With his magazine “Gourmet”, at one time highly acclaimed as the world’s most beautiful culinary magazine, Johann Willsberger has shaped and at the same time documented an entire culinary epoch at the end of the last century. With his distinctive aesthetics the Swiss resident has set the highest of standards and thus accorded to dining culture the place it deserves in art. Fritz Eichbauer has received a number of awards and has been highly honoured for his significant contributions as a developer; he has remained closely associated with the German construction industry as its honorary president. But Fritz Eichbauer has not yet been sufficiently paid tribute to for building the “Tantris” exactly 40 years ago. Who else can Munich and the world thank for this bastion of haute cuisine? Heinz Winkler was born in Southern Tyrol, and was the youngest cook to be awarded three stars in the Guide Michelin. At the time he was just 31 years old and, as successor to Eckart Witzigmann, chef in the restaurant “Tantris” in Munich from 1978 to 1991. Heinz Winkler not only was trained internationally himself, but he also worked indefatigably at renowned schools of cookery in Spain, Italy, the USA, Japan and Thailand. Greatly respected by his colleagues, Heinz Winkler has made a significant contribution to the excellent reputation of German haute cuisine around the world. The name “Tantris” means the ‘search for perfection’. For enthusiastic guests from all over the world, this Munich institution of pleasure has long arrived at harmonic perfection. For 20 years, Hans Haas, successor to Eckart Witzigmann and Heinz Winkler, has been the chef de cuisine in “Tantris”; the restaurant is a talent factory for top chefs. With great passion, just like on the very first day, Hans Haas utilises himself and his great creative potential unreservedly for and with this downright magical site of top cuisine. Hans Haas is an artist not only in the kitchen, but also as painter and sculptor. He connects in a visible way: cooking – art – culture.